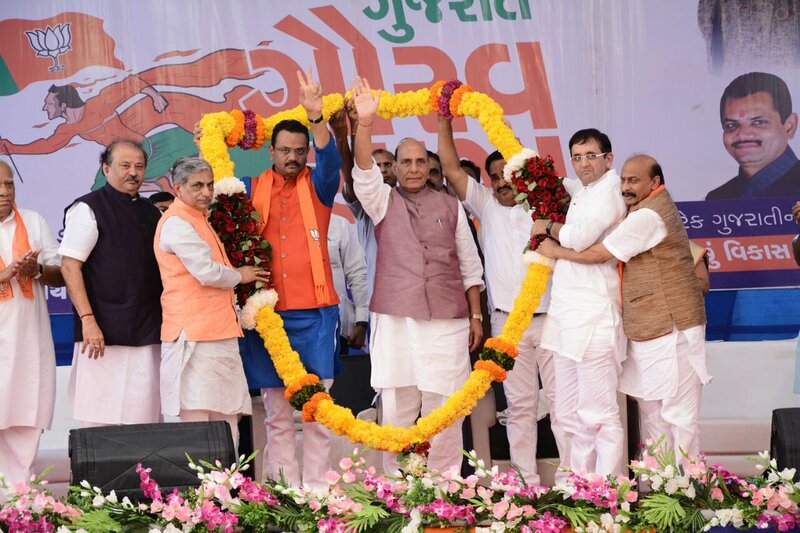 Addressing a public meeting at Bardoli, Gujarat, on Saturday Home Minister Shri Rajnath Singh said that Gujarat has contributed immensely in the process of nation building and equally in ensuring the integrity of India. Talking about the role played by Sardar Patel in unification of Indian state, after securing independence from British rule in 1947, Home Minister said, “I feel extremely fortunate to address this gathering in Bardoli which is karmabhoomi of Sardar Patel. The political unity which we witness today in India would not have been possible without Sardar Patel. It was the efforts of Sardar Patel that we live in unified India”. Talking about the progress and development made by Gujarat under BJP rule, Home Minister said that path shown by Mahatma Gandhi to Sardar Patel was followed by PM Modi too in ensuring development of Gujarat and entire country. He added, “People acknowledge this fact that Gujarat has witnessed impressive growth under BJP rule and has become a model state today. Gujarat is leading state in providing employment to youth from scheduled tribe. Gujarat is the leading state in providing employment to women and leads in host of other areas too. These are not small achievements. States across the country wonder how this is done”. Talking about how India has become a strong state under Prime Minister Narendra Modi, he said, “People ask how Doklam issue was resolved. To this I have only one answer; that India is no more a weak state and this fact was acknowledged by China”. He added, “For decades Pakistan has tried its best to harm India. But they should understand that now things have changed. Now there is not a congress government in the country. Rather India is served by a brave son of Gujarat”. He further added, “We have not tied hands of our soldiers. We have asked them to deal with enemies with iron fist. India is not a weak state. It has a firm resolve and ability to protect its integrity and interest. Expressing his views on Kashmir issue, Home Minister said that if India’s first Prime Minister Pandit Jawaharlal Nehru would have asked Sardar Patel to deal with Kashmir in the same manner as he dealt with Hyderabad and Junagadh, India would not have been facing the Kashmir problem today. “Kashmir would have emerged as a very strong state. However, as Home Minister I want to assure that Kashmir issue will be surely resolved. 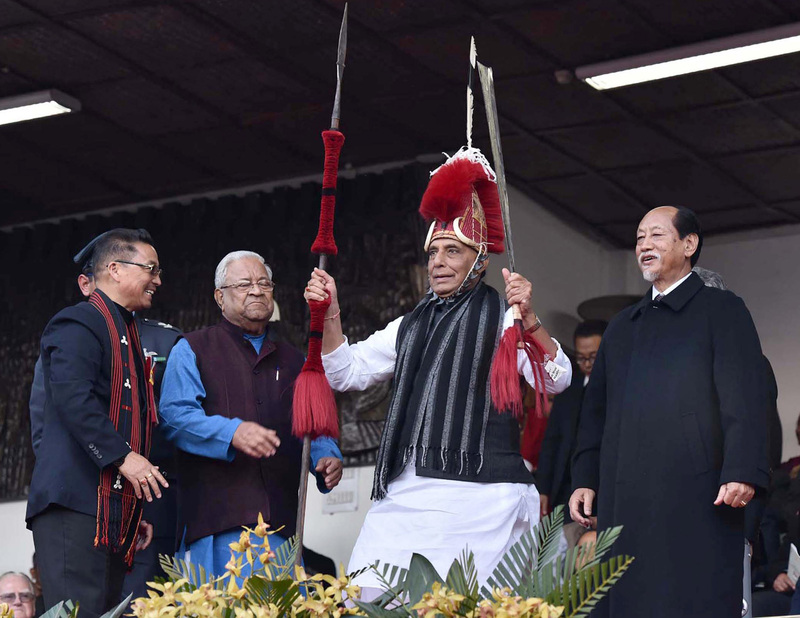 This is our firm resolve”, said Shri Rajnath Singh. Commenting on the remarks made by opposition regarding lack of development in Gujarat he said that those raising questions regarding the growth and development in Gujarat “could see the development when in congress rule 5 km roads were built in a day, but not today when 32 km road is built everyday”. Talking about development initiatives taken by central government Home Minister said, “Our PM has decided to get 5 crore families LPG connections by 2019 under Ujjwala Yojana. Did we ever imagine that one day every family will have a bank account? Our government did this. Those raising question should make rational assessment”. He added, “We will never hesitate from taking tough decisions if it is in interest of country and our people. We were told that if we take tough decisions we might face negative consequences in elections. I want to ask whether they think we made government just to enjoy perks of power. I want to tell that we made government to serve our people, to contribute in nation building”.